OKYO: A flexible electrical circuit one-fifth the thickness of food wrap could one day be implanted in humans, its Japanese developers say, as a health monitor or a control panel for paralysed people. The team at the University of Tokyo said the device, embedded in an ultra-thin film, is unique because it works even after it has been crumpled into a ball or stretched. Researchers unveiling the circuit said it could be used to monitor all sorts of physical data, such as body temperature and blood pressure, as well as electronic pulses from muscles or the heart. For people who can only move their tongue, the sheet might be placed on the roof of the mouth and serve as a touch pad to operate a communications device, team members said. 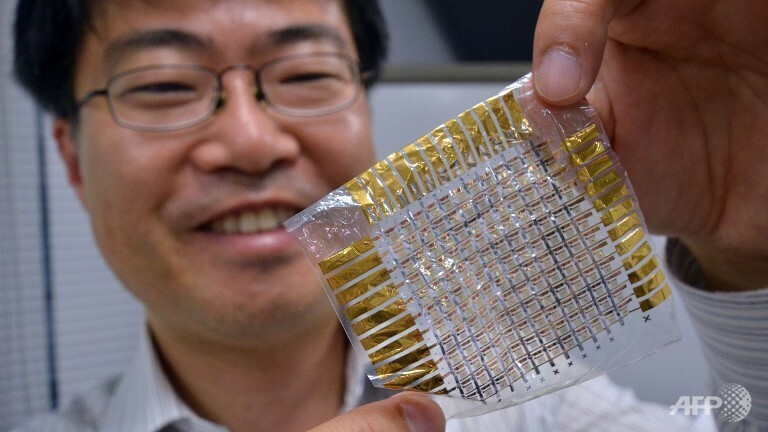 “This can be attached to all sorts of surfaces and does not limit the movement of the person wearing it,” said professor Takao Someya of his research, which was published in the journal Nature on Wednesday. Healthcare sensors often use silicon and other relatively rigid materials that can cause their users some discomfort. The new flexible circuits should reduce or even eliminate such stress, he said. Super-thin sensors could improve the lives of people who use artificial arms and legs, the research claims. Wrapped around arms or other body parts, they would pick up nerve signals which the wearer’s brain sends to the muscles when attempting to move, and pass the impulses to the limbs. Their flexibility means that people could put on more sensors that would be able to pick up biosignals at a far greater number of places, resulting in smoother, improved movement of artificial limbs, researchers said. The circuit could also be used as a shock-proof sensor for athletes, monitoring the body temperature and heartbeat during vigorous exercise. The circuit is just two micrometres thick — food wrap used in kitchens is typically 10 micrometres — and weighs only three grams (0.1 ounce) per square metre, Someya said. The product is so thin and light that, when dropped in the air, it falls while gently rolling and rocking, much slower than a bird’s feather. Its creation became possible after the team succeeded in creating a high-quality, super-thin insulating layer, Someya said. Even in a salty solution, like those found inside the human body, the device worked well for more than two weeks, raising the possibility that it could be placed inside human bodies for data collection in the future. Someya said more research needed to be done before that could happen. For example, while the film is nearly imperceptible, its effects on the skin with which it is in contact are not fully known and it is possible that rashes could develop. Making a reliable power source that is small enough to run the device is also a challenge.